Japan, land of the rising sun, and the historic circuit at Suzuka that Tom and the team enjoy coming to. The fans are so passionate and the country is a great place to visit and race. The team were looking to find a set up for the car that would work well on the short track and Tom spent both practice sessions working on this set-up. By FP 2 he was lapping in 54:519s which put him P13, less than half a second off the quickest time set by Yvan Muller. For qualification Tom had kept the required new tyres to set even faster times. He went out and set a time of 54:434s which put him P12. He then came in for new tyres. As he was being held in the pits to find a gap on the track, a piece of carbon which had come lose touched the hot exhaust and a small fire broke out around the exhaust. The team quickly extinguished it and sent Tom out again but the rear tyres were damaged with the flame retardant. Tom now had to pit again and time was running out. The tyres were quickly changed around and with time running out Tom went out to try and improve. He couldn’t find a decent space on the crowded track for his last lap and could only qualify in 23rd, though this was just over 1 second off the pole time. Race 1 and a good drive would be needed to make progress, but with 26 laps in the race a lot could happen. The rolling start was a messy affair but Tom settled into the race and started to make up places. By the second lap he was up to P20 then on lap 12 he went past Kozlovskiy and was chasing down Darryl O’Young in the BMW. He was glued to the rear of his car but couldn’t find a way past. On lap 19 both factory Honda’s had to retire, and Pepe Oriola in his Chevrolet came in following a drive through penalty. Tom was now into P17 and in a fight with the next 5 cars to make up places. On lap 22 though the engine started to misfire, and he was forced to retire from the race. With a quick turn around between races the issue was diagnosed as a fuel system issue. The component parts had been thoroughly tested prior to the race meeting but it seemed the problem was more complex. Tom went out for race two hoping that the system would last the course. The race started with the new World Champion Yvan Muller being pushed off the track into the barriers. This brought out a yellow flag in sector one for the first 8 laps. Michelisz was also forced to retire due to damage sustained in the incident with Muller. Tom was in P19, then on lap 8 he went past Kozlovskiy and then on lap 3 he past Kano in the BMW. Again things were looking promising for a good result as he looked to pass Izawa in the Honda but on lap 17 the fuel system issue returned and he was forced to retire once more. 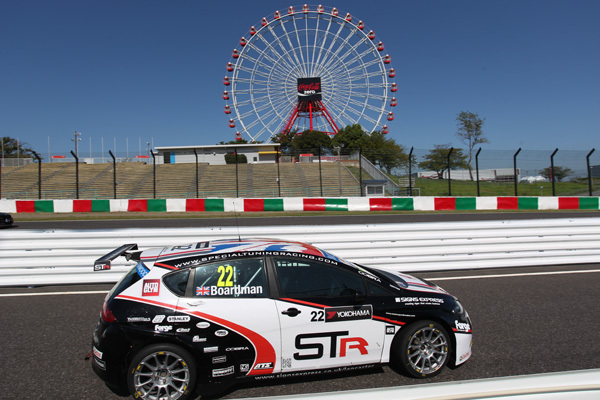 The team now goes to Shanghai at the beginning of November for the penultimate round of the WTCC.